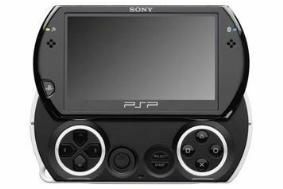 E3 2009: Sony officially announces PSP Go | What Hi-Fi? The spec is pretty much as expected: 1GB of flash memory, expandable by memory stick, and built-in Bluetooth, but no UMD drive. Sony says it will not replace the PSP 3000 and that games will still be available on the UMD format. However, all games will be available as downloads for both devices. New MediaGo software should make it easier to transfer music and movies to PSP Go, and music playlists will be available. It's expected to cost 249 Euros – and hence probably £249 – when it launches here on October 1st. Check out our blog for more pictures, and our sister site stuff.tv who hope to post a hands-on video live from E3 later tonight.